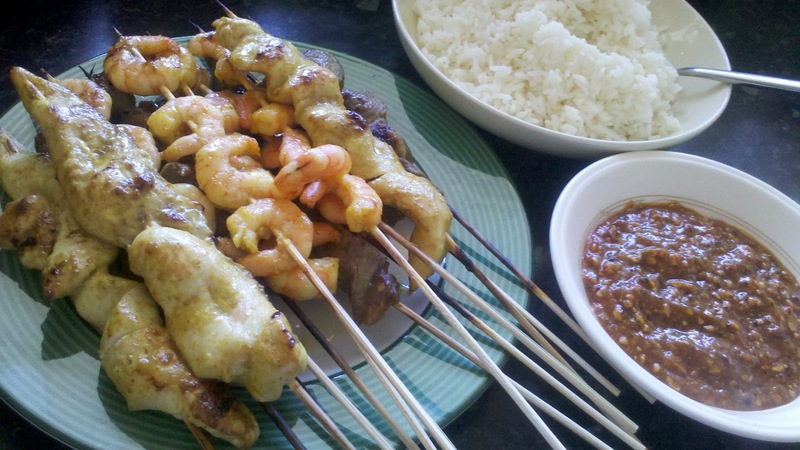 This week's Worldfoods challenge was Satay - we were given the satay recipe and instructions on how to make a chilli and peanut dipping sauce to go with it. I love satay, although I've been jealous of other members of the team because I live in a top-floor flat and don't have access to a barbecue. So I soldiered on and used the grill! The satay itself wasn't what I usually think of when I imagine satay - I'm used to the light brown, sticky, sweet peanut flavours - this was much more lemony and aromatic, and really refreshing and tasty. Because the meat was marinated for a few hours the meat also seemed more tender and the chicken breast stayed really juicy even after a blast under a hot grill! 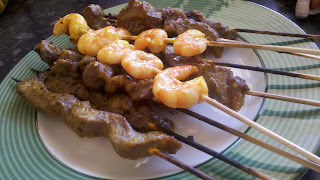 Surf and Turf... satay style! leave the marinade on the meat and fish for at least 3-4 hours, preferably overnight. I left mine about 8 hours in the fridge. cooking times - for the beef, approx 8-10 minutes - chicken, approx 7-8 minutes - prawns 2-3 minutes, but cut into one to make sure they're fully cooked before serving. it's been a while since I stir-fried peanuts and I forgot that especially when ground up they can catch and burn really easily - cook really gently otherwise you'll end up with lots of tiny black burnt bits in your dipping sauce. You can serve this with bite-sized wedges of cucumber and red onion, as May suggests and it's traditionally eaten with a Malay rice cake called "ketupat". I served mine with plain, boiled rice. 1. Marinate chicken, beef and prawns (or whatever meat and fish you want) with WORLDFOODS Thai Turmeric Lemon Grass Marinade for at least 3-4 hours. Best if refrigerated overnight. 2. Thread meat and fish onto skewers. 3. Preheat grill. I used the grill from my oven, but if you have access to a barbecue use this! 4. Baste the skewers with cooking oil and leftover marinade and cook over (or under!) a hot grill, turning occasionally until cooked. 1. Heat 1 tbsp of cooking oil. 2. Add in peanuts and fry gently for 1-2 minutes till aromatic. 3. Add in WORLDFOODS Malaysian Chili Coconut Marinade, bring sauce to boil. 4. Serve warm as a dip with the skewers.